Duncan is an Honorary Research Fellow in the Department of Archaeology who specialises in medieval settlement, conflict and landscape archaeology. 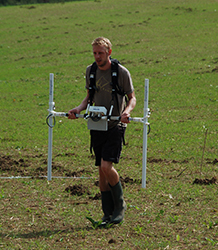 Duncan's work possesses a strong inter-discplinarary aspect, incorporating in particular documentary and topographic evidence to enhance archaeological investigation. His doctoral thesis, an edited version of which is available through Archaeopress, examined Middle Saxon settlement and social change in central and eastern England. Following completion of his PhD, Duncan worked as a Research Fellow on the research project Anarchy? War and Status in Twelfth-century Landscapes of Conflict. The project, which was funded by the Leverhulme Trust, has various outputs, including a leading monograph to be published by Liverpool University Press, and an article in Landscape History on the medieval and earlier history of Burwell Castle, Cambridgeshire. A complementary volume of the fieldwork undertaken as part of the project will also be available through Archaeopress. Duncan is Senior Lecturer in Archaeology at Bishop Grosseteste University and Reviews Editor for the Society for Church Archaeology.